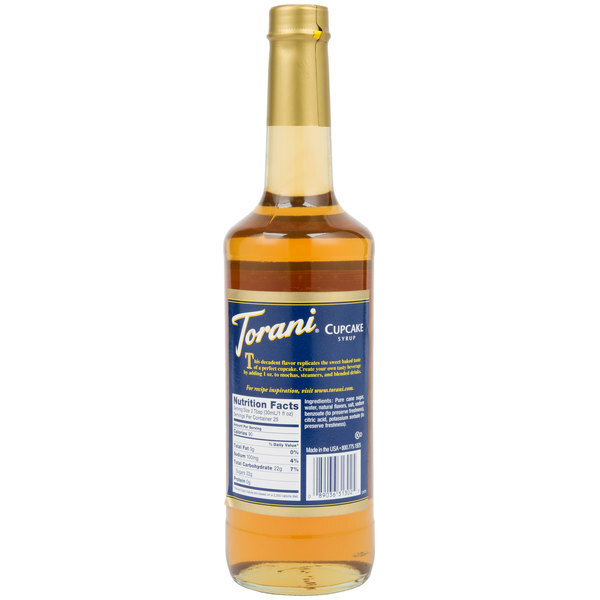 Bring all new flavors to your specialty drink menu with this Torani cupcake flavoring syrup! This tempting flavor will complement your beverages without overpowering them or being too sweet, while the user-friendly bottle will be convenient for your busy baristas to use. Torani flavoring syrups are specially formulated to resist curdling in milk and to hold up well under heat, making them the perfect choice for espresso-based drinks, brewed coffee or tea, and more. Use this flavor for frappes, iced coffees, smoothies, and even baking! Turn any occasion into a sweet celebration with this cupcake flavoring syrup! 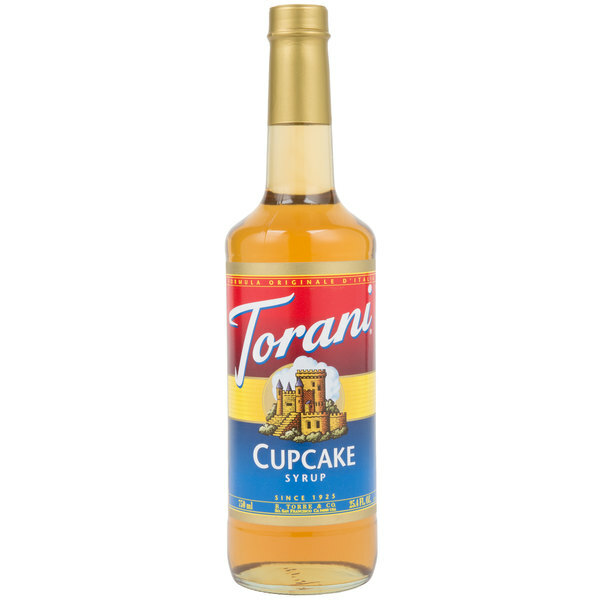 Torani cupcake flavoring syrup brings the richness and sweetness of oven-baked cupcakes to any drink. Discover new Torani recipes for this flavoring syrup, including a cupcake steamer, cupcake sweet tea, and white angel cupcake. What goes better with ice cream than a cupcake ? Nothing, so I use this to create various cupcake flavors that the customers enjoy and order again and again. Who doesn’t like cupcakes ?! This syrup is so delicious ! It also mixes well with other torani flavors with it like s’mores or cookie dough . Highly recommend. We love almost all the Torani syrups! They pour well, taste good, blend into drinks well, and are DELICIOUS! Put them in tea, coffee, Italian sodas - whatever you like, it doesn't matter, they are great. We wouldn't use any other kind! We are a bakery, so we use this as our house coffee! It is like an espresso cupcake in a hot cup - amazing. Torani cupcake is one of favorites. combine it with other flavoring or leave it by itself to create a great iced coffee or cup of coffee. This is a cheap, great tasting way to spice up a regular cup of black coffee. I have ordered many Torani syrups and this is by far one of my favorites! Its also equally as good as a small drizzle on deserts! This is a crazy good flavor! We use it with other syrups to make "strawberry cupcake" and "blueberry cupcake" flavors! There are a lot of different things to do with this flavor. Ok so I honestly wasn't sure if I liked this one. I tried it several times and it was just off. Then I got creative and added raspberry with it, yum! So I like this one with other flavors just not on its own. Really nice with cinnamon. I would say experiment and have fun. It is on the sweet side, so a little pump will do ya. I think it tastes like the cheesecake icing you get in the tub at your grocery store. A subtle cupcake flavor that doesn't overwhelm the drink with sweetness. Combines well other flavors to create specialty drinks that will delight your customers every time. We really enjoy this one due to its sweet taste. We have used it in our milkshakes made at home and our iced coffees too. YUM. Torani never fails to amaze me. I have had almost all their flavors and they are always so so good. The cupcake flavor tastes rich and yummy. I have friends who will pass the coffee shop and come to my house just for the coffee make with this syrup! It's an exact flavor replica and super easy to work out your own recipes with this as a building block. The Torani 750 ML Cupcakeflavoring syrup tastes great. It tastes like vanilla cupcakes and works well in our espresso based drinks that we make in our coffee shop. This Torani Cupcake Flavoring Syrup is great! It has a wonderful flavor and goes great with the little cupcake bites in ice cream! I would totally recommend! WOW! WOW! & WOW! This syrup is so delicious, it flavors just like a vanilla cupcake "it should be called vanilla cupcake". No aftertaste! Doesn't take much at all, no need for any additional sweeteners. Love It! This flavor taste exactly like cupcake without a wierd after taste like most syrups. Torani is the best of the best when it comes to flavors. The flavor is super rich, but a kid favorite. This one will for sure become a popular treat. We use the cupcake flavoring syrup for one of our mochas. You can also add other flavors, such as, Chocolate, Caramel, Cherry, or Raspberry, to mix things up. Our customers love Torani Cupcake Flavoring Syrup! It has the perfect flavor that our customers are looking for! It matches so well with any topping! This is a must have for birthday themed mixed drinks. It's also great in sodas and baked goods. Recommend getting a pump top to go on the bottle for measured and easy dispensing. We use these for cupcake steamers, which is basically this syrup and steamed milk. Taste just like your drinking cake batter. Which everyone loves around here. Having a variety of Torani syrups really helps with making our kids some tasty treats! This cupcake syrup is one of the most authentic tastes we have purchased. It is not overbearing and offers a burst of sweetness. True to taste and is a great additive for other baked goods. Our customers love this one. It's unique and sweet and smells just like a vanilla cupcake (or birthday cake iced cream) it works great in frappuccinos. Ive been using this cupcake flavoring for years. It has a buttery vanilla taste. it;s perfect for both hot and cold coffee and mixing into cocktails. I enjoy all of the Torani flavoring syrups! Since I sell cupcakes, I thought this syrup would be a fun addition. The flavor is nice and sweet, but not necessarily cupcake. It is still a great taste and a great product. AMAZING and delicious product. Customers love the flavor in their milkshake and employees have to practice their self control to not eat the product. I would definitely recommend this product to others! Great mix with strawberry smoothie mix and blending it with milk! Taste like a strawberry cupcake! LOVE IT! Customers love it and the price you cannot beat. Torani's Cupcake flavored syrup tastes like a cupcake batter. Our customers have enjoyed it in iced lattes with sweet whipped cream to top it off! This is a great syrup to combine with others in iced coffee. We find that our customers like it with strawberry syrup. Another popular use is in hot chocolate. I wil definitely be ordering more, nice addition to the plain ole cup of coffee, it's also great on ice cream! Would make a nice gift for a coffee drinker! Like biting into a real cupcake. The flavor is very true! I have added this one to my frosting and it is wonderful. Love these syrups! Great shipping - it came completely wrapped in bubble wrap so the glass wouldn't break. Torani syrups are the best, you really can't go wrong with these.